Before I begin... I want to warn you, this post is loaded with pictures! Lots and lots of pictures of sunshine, ocean and so much better weather than we are having now in February in Ohio! Now go on and read... you have been warned! We left Bradenton early in the morning (to get out of our bad Airbnb asap) and headed to Miami. 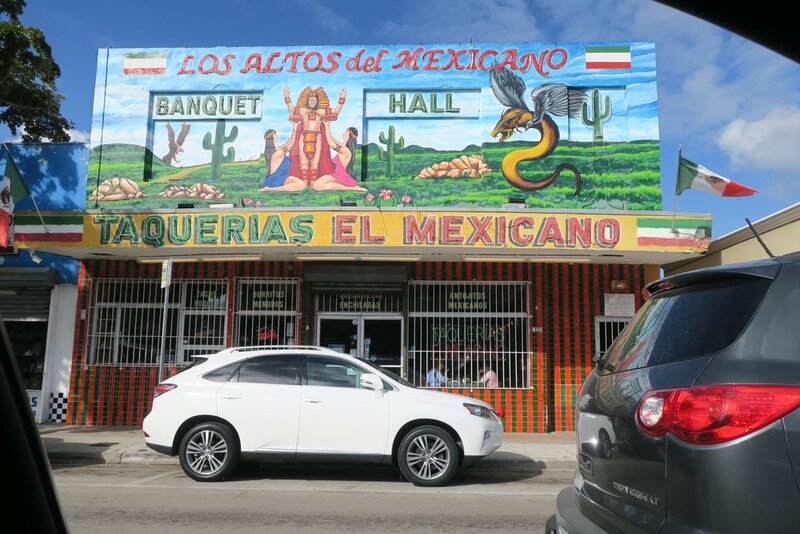 The plan was to show the boys Little Havana and the South Beach area in Miami and then head to our Airbnb that was located between Miami and Key Largo. I was a bit worried about driving our kayak trailer through Miami and especially parking. But I couldn't believe that I found almost immediately a spot big enough in Little Havana right off main street! The kids loved Little Havana. Jake decided that he needed a hat and asked if he could buy a cigar for the future (no). Both of them loved watching the men play Domino in the park and of course needed their own set. We drove through Miami but we had a feeling it would be hard to find a spot, yet alone a parking spot that was secure enough to leave the kayaks. So the next few pictures are just random pictures taken from the car. The original plan was to head to the Airbnb after checking out Miami but on our way we spotted a sign to the Biscayne National Park. Of course we decided to stop and even though it was a short visit it was worth it. Finn added another Junior Ranger Pin to his collection. Can you spot Miami in the picture below? 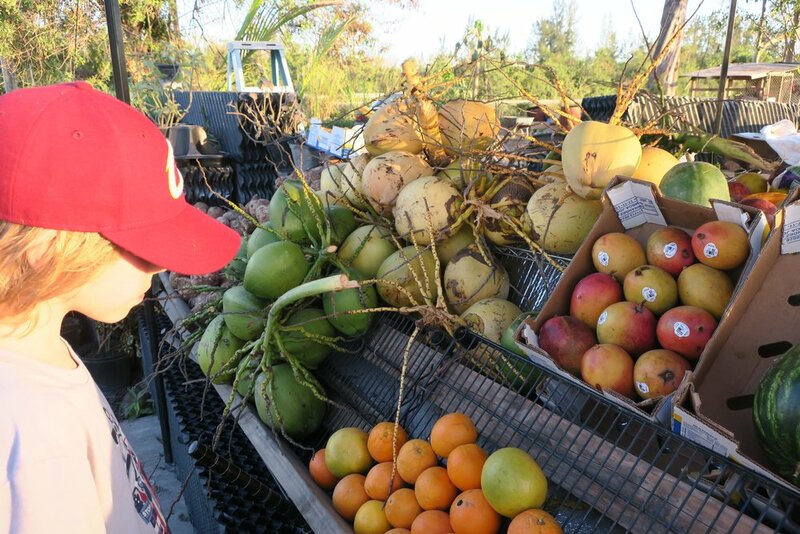 After we left the National Park we stopped at at roadside fruit stand (You know we can't skip those) and got two coconuts and some fresh squeezed sugar cane juice. The kids surprised us and didn't like neither. The next morning was the big day we have been waiting for! Snorkeling in Key Largo. We got there early (hey! I am a good German and will live by the rule of being early for everything) and had enough time to grab something to eat. Scot spotted this little Cuban cafe and it was perfect! The food was excellent! The Empanadas were the best I had all trip (remember my bucket list item from this POST) and the rest of our breakfast was just as good. With full bellies we drove to the port and were welcomed by Captain Karsten (from Germany) on board. We decided to go with Keys Diver & Snorkeling Tours and we highly recommend them. The really gave us a fantastic snorkeling experience and were so kind and patient with the boys. How do you like my new prescription sunglasses? The snorkeling tour was about 4 hours long and we were taken to 3 different reefs. The boat ride to and from these snorkeling spots were perfect. The sun felt so good on deck and if we didn't even go snorkeling the boat ride was already perfect enough. Snorkeling was fantastic as well. We saw so many colorful fish, lost of barracudas and we did see Jesus ;) The only thing that was difficult to me was to keep an eye on my kids. Every time I looked in a different direction they were gone, they were just way to fast for me and I had visions of them floating away in the Gulf of Mexico. I realize that's being over dramatic but I did not enjoy constantly having to try to find them versus just enjoying the snorkeling experience. Hopefully this will get better the older they get. On board was a little girl from France and Finn and her hit it off despite the language barrier. They played peek a boo, charades, rock paper sciccors and this weird head bumping game that only the two of them understood. This day couldn't have been better and I know we will talk about this adventure for a very long time. Now please can someone take me back to this sunshine??? Being in the Florida Keys we made it our mission to find THE BEST key lime pie. We asked a few locals and everyone had the same answer: PUBLIX the grocery store chain has the best one. So on our way back from snorkeling we stopped at Publix, bought a key lime pie and ate it in the car on our way home. Perfect ending to this day! And yes it was soooooo good! Btw... we had this weird experience with chickens on this trip. Not only did we see them in the parking lot in Key Largo at Publix but then a few days later we saw a bunch at a gas station in Georgia! So weird! And because I want to end this post with my favorite picture... VOILA! Brothers actually getting a long!